At a time where large companies are revving up the hype trains and are releasing game changing recolors and wireless mice it might be easy to overlook the release of the brand new DM1 FPS by Dream Machines. We didn’t overlook it though, and how could we? With a 3389 sensor, super light weight and a brand new ‘shoelace’ cable it has all the markings of a top tier gaming mouse. Dream Machines has been producing quality products for a while now, but it’s tough to really stand out in this rather saturated gaming mouse market. Is the newest iteration in Dream Machine’s DM1 line of mice an endgame FPS mouse or is it more of a (sorry, we couldn’t help ourselves) nightmare machine? To find that out we’ve sent over a copy to our mouse reviewer. Read on to see what he made of it! Note: the unit that our reviewer tested is the matte ‘Blizzard White’ version. The DM1 FPS is also available with a glossy finish. 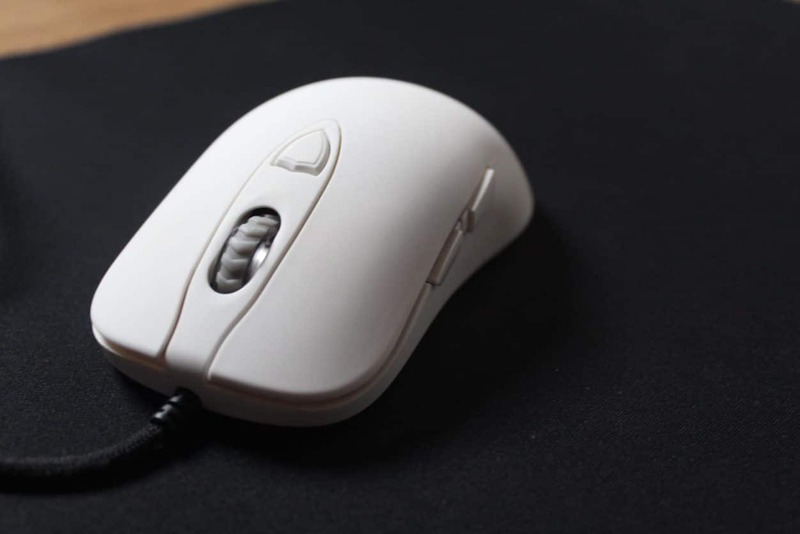 This DM1 FPS is definitely a bit of an eye catcher thanks to its completely white design, which is rather unusual for gaming mice. It’s a simple, lightweight ambidextrous mouse which is finished off with the Dream Machines logo towards the back of the unit. The cable is obviously another aspect which will be noted by gaming veterans, but more on that later. The DM1 FPS does come with (fully customizable) RGB lighting behind the scroll wheel but that lighting is so dim that it might as well not be there in my opinion. For me this is an absolute non-issue (I don’t care about RGB on my gaming mice at all) and the RGB light still has its use (I use it to indicate what DPI the mouse is currently on) but people who like to look at pretty light shows will be a bit disappointed with this. 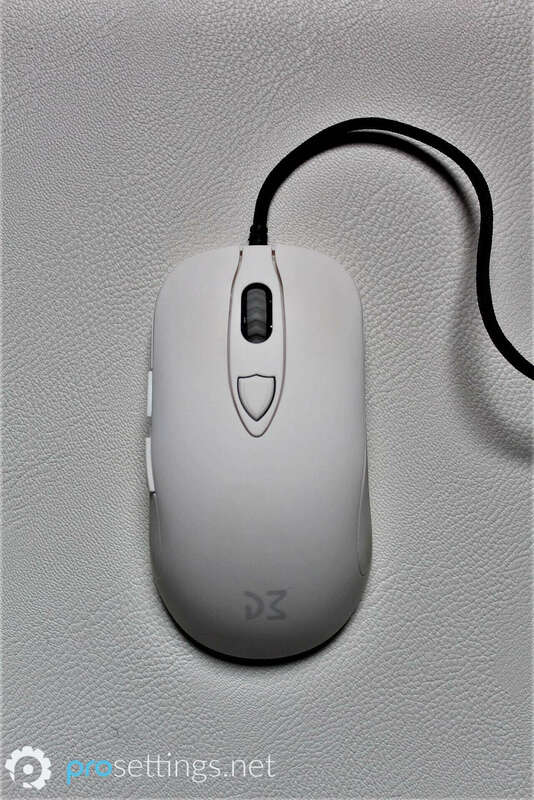 The DM1 FPS is a medium sized ambidextrous mouse, coming in at 12.6cm in length and about 7cm at its widest point. It’s about 4cm high and it doesn’t really have any super pronounced or awkward humps so it should work for a large variety of grip styles. The DM1 FPS also has the customary two side buttons (on the left side only). The mouse is advertised to weigh 83 grams without the cable, and when I put it on my scale I got to about 81 grams, so it definitely is a very light specimen. It’s available in two different coatings; matte (the Blizzard White and Noir versions) and glossy (the Blood Red and Ocean Blue versions). The packaging is pretty sleek. There is a distinct lack of any marketing mumbo-jumbo, with the box only having a 1:1 outline of the mouse (along with the name of the model and the company) on the front, and ’20M Huano,’ ‘Pixart 3389,’ and ‘DPI 12000’ (which is kinda weird since this sensor goes up to 16000) on the back. Inside the box we obviously find the mouse, one set of replacement mouse feet (which is always very much appreciated) and a rather humorous quickstart guide, containing info such as ‘don’t use the mouse in the rain,’ along with the usual stuff on how to start using the product. Companies including spare mouse feet always get an extra mention from me, so kudos to Dream Machines for doing that. The DM1 FPS is an ambidextrous mouse with a pretty safe design. It’s got no massive humps or outlandish design decisions which could offend some people so I can imagine a large variety of people being happy with this shape. 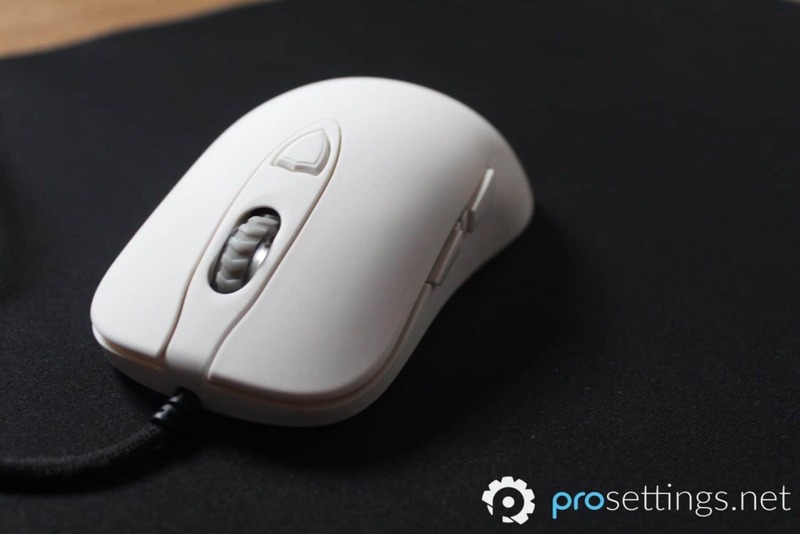 It’s not an original shape, with Steelseries having used it for their Sensei and Sensei Raw models, for example, so if you liked any of those you’re going to like this shape as well. People with really small hands might have some issues using this mouse, but thanks to its very comfortable design I’d say it’s good to go for almost all grip styles for most people with normal sized hands. Pure palm grippers might want to hold it in real life before purchasing, since it’s a relatively flat design with no real hand-filling hump so if you’re into that sort of thing you might want to be wary. As mentioned before the mouse can be bought in two different finishes: matte and glossy. The version I got (the Blizzard White version) features a matte coating, and it’s a good one. The mouse seems to be finished with a very, very slightly rubberized coating and I absolutely love the finish of it. I tend to get sweaty hands pretty quickly when I’m playing intense games and I had no grip issues at all during my testing. The mouse also didn’t feel icky after a few days of gaming, which can be a problem with other mice. The pristine white finish does tend to become a bit beige/yellow-ish after heavy prolonged usage, but that’s remedied by a two second cleaning cloth wipe-down, so I can’t really see that as a negative. Half of the product shots I used for this review were made after I had been using the mouse for days (and wiped it down) and I can’t see the difference. Obviously I haven’t been using this mouse for months so I can’t speak of how the finish lasts after a longer period, but I can say that it held up fine during my testing. 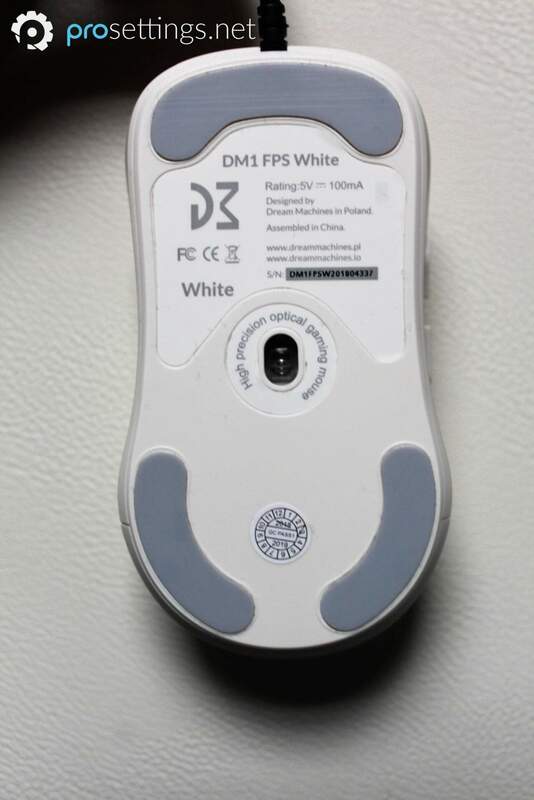 The DM1 FPS features a (kind of strange looking) DPI button which is located on the usual spot and two easy to reach side buttons. It has three large sized mouse feet, which provide a rather controlled, though smooth glide. The DM1 FPS now features (due to popular demand, according to Dream Machines) Huano switches. These are, by default, a little bit stiffer than their Omron counterparts but that doesn’t mean that they’re difficult to press or anything. 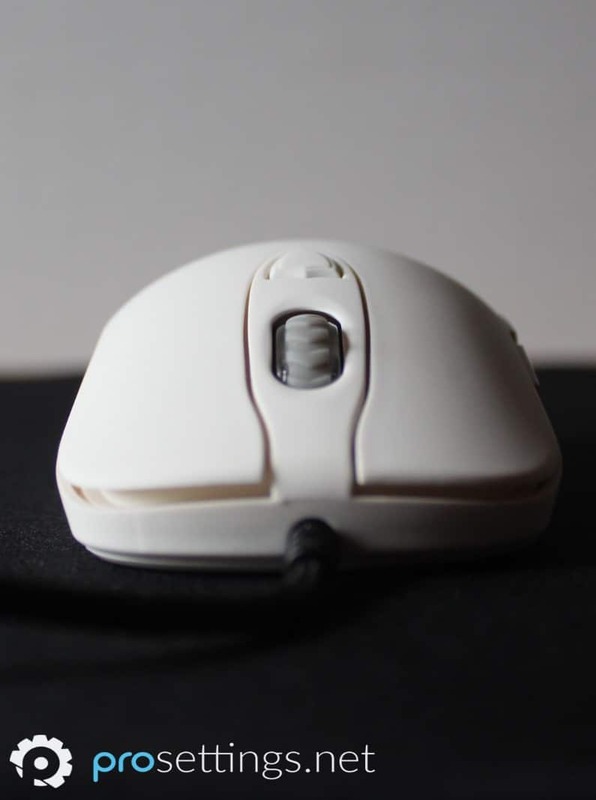 The main mouse buttons on the DM1 FPS provide a very pleasant and tactile feeling click and thanks to them being just a little bit stiffer it’s impossible to accidentally click them, which is an advantage in itself in my opinion, since accidental clicks can mean certain death in some games. If you absolutely need hair-trigger buttons which actuate at the slightest breeze then it’s probably best to skip this mouse, but in my opinion these buttons are implemented very nicely and will work fine for 99% of gamers. The scroll wheel’s steps are easy to identify and the wheel itself is nothing special, but I do wish they’d make the scroll wheel a little bit easier to press, as right now it’s a bit too difficult to press to my liking. The side buttons have very little travel time and provide a nicely noticeable tactile click when actuated, so props for those. Summarizing: the mouse buttons on the DM1 FPS are super nice, though the scroll wheel (and especially the M3 button) could be improved on in future iterations. Dream Machines is a relatively new player in the mouse making game, but there are no QC issues on my unit at all. Despite it being a super light mouse the DM1 FPS feels sturdily built, and there’s nothing rattling or frolicking about when I violently shake the mouse or do big, quick sweeps on my pad, so props for that. Obviously the cable is one of the major draws of this mouse, with Dream Machines advertising their shoelace cable as being ‘invisible.’ That’s a pretty bold claim, but I do have to say that I didn’t once notice it while playing. 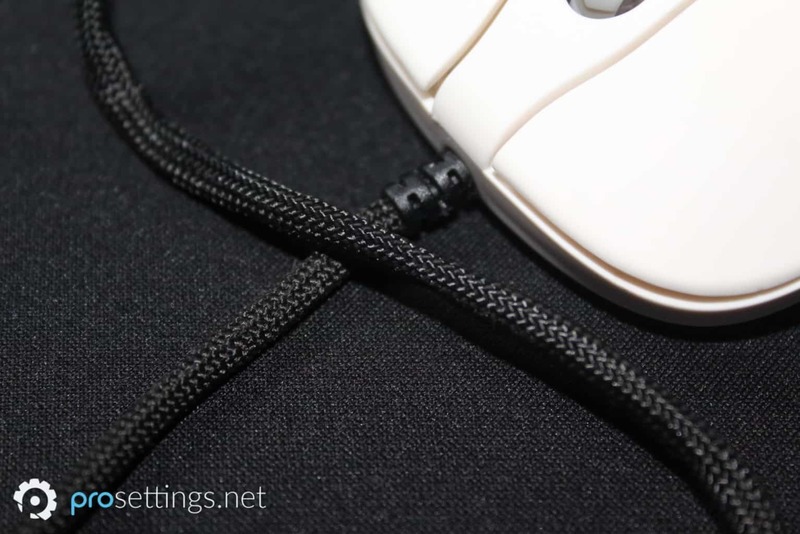 I play shooters at a rather low sensitivity so carrying around a log of a cable while frantically flicking just isn’t an option for me, but this shoelace cable really is the best you can get out there at this point if you don’t want to mod your mouse with third party cables etc. I used a mouse bungee intermittently during my testing time with this mouse, and even when not using it the cable managed to feel invisible 99% of the time. You obviously notice that you’re wired up if you focus really hard on trying to feel the wire, but I never felt limited in any way when I was out there gaming and I never had one of those ‘I can feel the cable’ moments. That’s exceptional, and other mouse manufacturers should look towards this mouse if they want to improve on their cables. The DM1 FPS uses the Pixart 3389 sensor, which is an improved version of the 3360 in the sense that it goes up to 16000 DPI. I don’t know any lunatic who actually plays with a DPI that high, but since the 3389 apparently doesn’t come at an extra cost I’m all for including it. As we all know the 3360 (and thus, the 3389 as well) is a flawless sensor. It will handle anything you throw at it without spinning out and it does so without any smoothing or jittering, so you only have yourself to blame if you’re missing every easy shot. The implementation of the sensor is done perfectly in the DM1 FPS, so the ingame performance of this mouse is completely flawless. 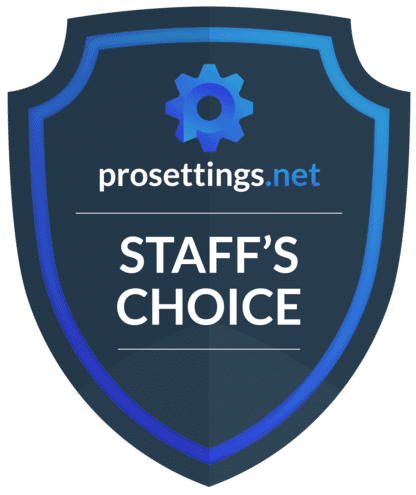 You can just plug the mouse in and start gaming, but Dream Machines also offers optional software, where you can change the lighting, configure what each button does, make macros, and so on. If you don’t want to install yet another program you can just download it once, mess about with the settings until you’re satisfied and delete it, since the DM1 FPS has onboard memory. The software itself is nice enough though; it’s easy to navigate and doesn’t have any unnecessary tabs or functions. All in all; as expected from a mouse with a 3389 sensor the DM1 FPS performs completely flawlessly ingame. 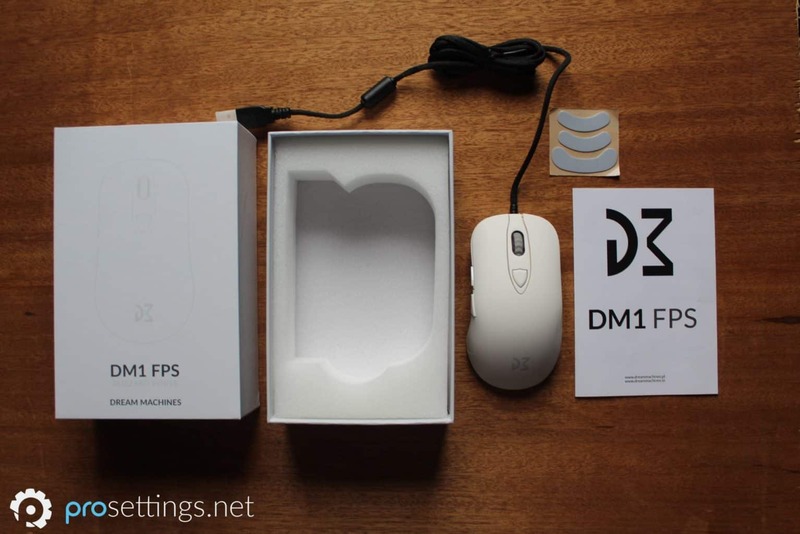 As said before: the DM1 FPS is a medium sized mouse with no real pronounced humps or other crazy design elements. As such it should be a good fit for almost all grip types, provided your hands aren’t too small or comically large. I wouldn’t recommend it for pure palm grippers who like to have a ‘full palm’ (unless you’ve got pretty small hands) since it’s a relatively flat mouse design and as such doesn’t really offer anything to fill up the palm of your hand. For reference: I have 18.5×10.2 cm hands and this mouse is near perfect for my grip type (which is a sort of hybrid but predominantly claw). The DM1 FPS hasn’t gotten a whole lot of mainstream attention (yet) and that’s a shame. It’s one of the best gaming mice that I’ve had the pleasure of using this year so far. The cable is the obvious MVP for me here. Yes, the DM1 FPS has a great shape, great buttons, and a flawless sensor, but there are plenty of mice out there who also have that. What they don’t have (apart from perhaps the FinalMouse UL Phantom, which is a limited edition release so I’m not sure if that counts) is this super light and flexible cable. Of course I wouldn’t recommend a mouse based on the cable alone, but combine that cable with the other great aspects of this mouse and you’ve got a product that literally no one else can offer at the time of writing, unless you want to open up your mouse and install an aftermarket cable. If you absolutely need super light clicks then the Huanos in the DM1 FPS might not be your cup of tea and the scroll wheel can be improved on too. If I’m really nitpicking at a molecular level then I’d say that the side buttons could be better (they’re really good now, but not perfect) but apart from that this mouse is an absolute top product. Dream Machines might be a relatively new player to the gaming mouse market, but they’ve hit a straight home run with the DM1 FPS. 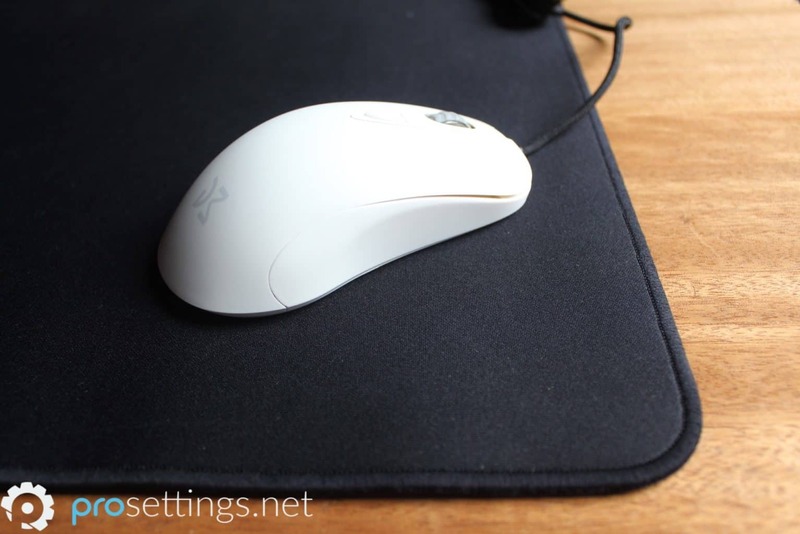 I have a Nixeus Revel here and im switching between it (same shape as the DM1) and the Logitech Pro Wireless. Can’t decide which one feels better since both are sicK! Thank you, they are definitely both great mice and you can’t go wrong with either of them. Would you recommend this for 19.5 cm hands, with a slightly relaxed claw grip? Current use g203 (budget version of G PRO, sharing the same shell as it and G 305. Thanks in advanced for the response. 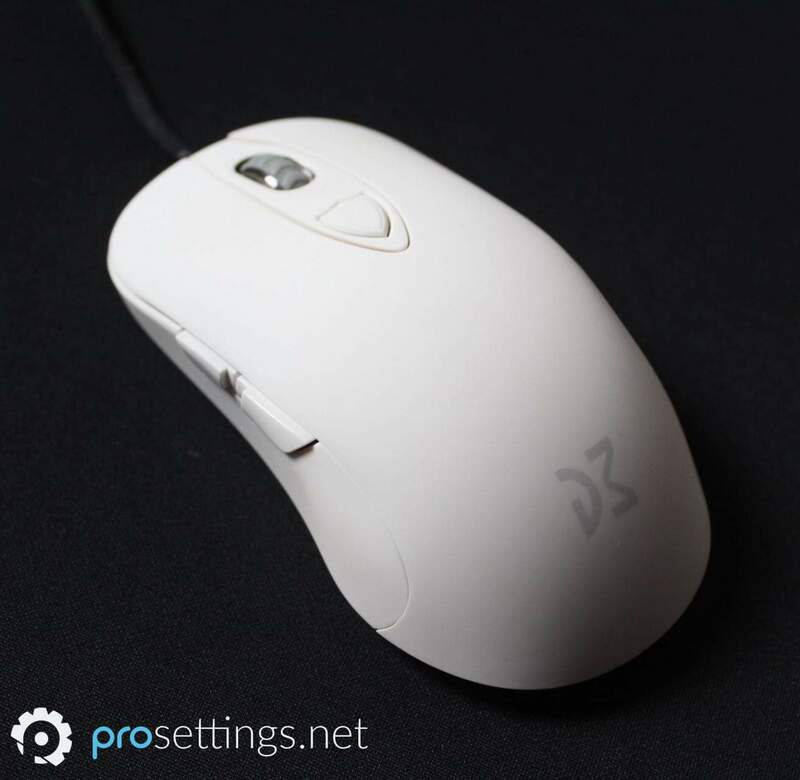 The shape of the DM1 FPS is much different than the G203/G305. It should fit your grip and hand size very well however. Nice review. This is such a great product. 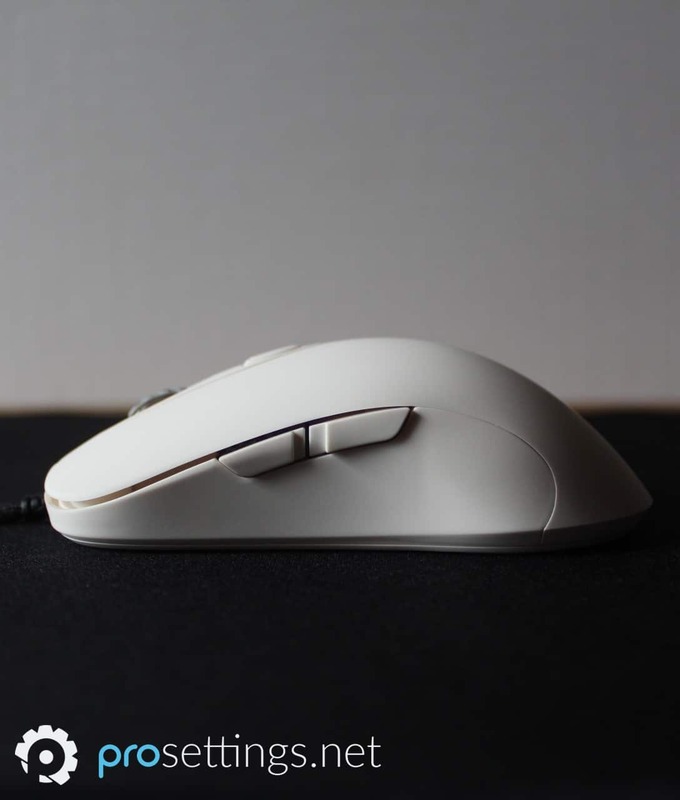 I recommend this mouse to any Sensei users or someone wanting a safe and comfortable ambi shape. I’ve bought the glossy and matte versions. I personally like the matte finish. Thanks! Glad you liked it! It’s a really great mouse indeed, it’s flying under the radar a bit unfortunately but I do think it deserves some more mainstream recognition. So.. importing it from Scandinavia and hope it equals, or bests, the Sensei of old! I’ve never extensively used the Sensei through longer periods of time to be honest, but I feel quite confident in saying that if you liked the Sensei you’re going to be loving this one. When it comes to shape it should be an exact match and the build quality, sensor, etc. are all top notch so trying the DM1 out should be on the top of your list if you loved the Sensei. Availability is definitely a bit of an issue when it comes to these smaller brands. It’s understandable but for mouse enthusiasts that can often be a source of frustration. As I said though; I really think you’re making the right decision by trying out the DM1 FPS and this one could be your daily driver for the foreseeable future. Let me know how you liked it! Well, turns out DreamMachines has 3 websites. Dreammachines.pl, .eu and .io. Anyway: just got it and love it. It’s so much lighter than the Sensei but as mentioned, better sensor and simpler software with the same features but better UI. And that cable, just wtf? You really don’t know it’s there. It feels exactly like a wireless mouse, but it’s not. Amazing! I hope these cables become the norm for ALL PC Peripherals in the near future. Hey, glad you got it okay. It’s nice that you love it, I kind of had an inkling that you’d love the mouse based on your description but it’s always nice to see it confirmed. I do agree though, the cable in particular is absolutely revolutionary in my opinion. There’s other mice with great sensors, and shape etc. is subjective but that cable is just great and the build quality is amazing. Definitely a benchmark for the future. Enjoy the mouse! This mouse seems very nice, but I can’t find it on amazon and the dream machines website only ships to poland. So do you know where I can purchase it online, and have it shipped to the US? Hi! Unfortunately I don’t really have an answer to that question. I can see on the Dream Machines website that they do seem to ship some product to the United States (under the ‘Where To Buy’ tab) via their own website so maybe the DM1 FPS still has to be added to that lineup and/or Amazon. It might be a good idea to send them an email or contact them on social media, they seem to be a pretty responsive company and I doubt you’re the only one in the USA who’d like to buy the mouse, so maybe it’s a matter of waiting it out in order for them to get the logistics sorted out or getting the ball rolling by showing interest. I’m sorry I couldn’t be of more help on this matter and I hope you manage to get your hands on the mouse in the end! You can purchase this mouse in the US. All you have to do is use the drop down for the ship to on the top right and select country United States – Add to cart. They seem to have a stock in the US that ships out of Minnesota. I’ve ordered two within the US and it usually takes 5-6 days to receive the mouse. They ship through USPS as well so there is a chance you can get the mouse on a Saturday as well. There you go! Thanks for the help! I have this mouse in Ocean Blue and it is fantastic. I own over 10 mice, all the latest high quality high performance mice and DM1 FPS still went straight to my main driver. It hits every mark for me. I find the little bit stiffer clicks better for rapid tapping too. There is not much to say, every thing that could be upgraded is such minor issues it’s almost no worth to whine about. Shape on the other hand ends being personal preference. I bought a dm1fps in White bc of this guide. Unluckily the mouse wheel gets stuck when I scroll down. I’m hoping they’re able to send me a replacement. Oh, that’s a shame. Defects can always happen though, I’m sure they’ll send you a replacement. Glad to know you found our review useful! Hopefully you’ll be able to fully enjoy the mouse soon. I heard that the different colors come with different coating covers as well. Which color would you recommend for someone with sweaty hands? I have rather sweaty hands myself (certainly in the summer) so I tend to gravitate towards rubberized feeling mice, since glossy coatings often don’t ‘absorb’ the sweat properly and leave traces of skin oils etc. more easily. So I’d say you’re probably better off getting the White or Noir version. It’s a preference thing however. I know people with sweaty hands who swear by glossy coatings as well, so take this opinion with a grain of salt.